Thank goodness for spring break! I have had this piece done for a while and just haven't been able to post about it. 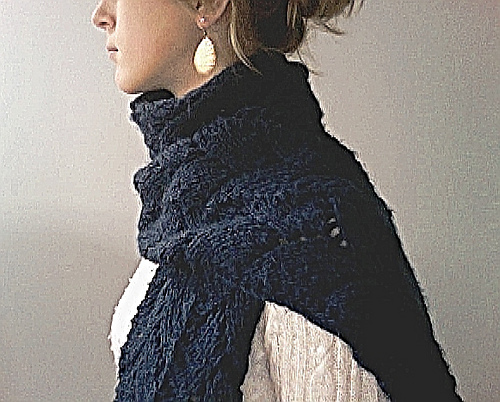 I had admired the Haven scarf by Kim Hargreaves for a long time. Unfortunately, the price and shipping of the book just for one pattern was not in my budget range. Thankfully, I recognized the lace pattern in the scarf and saw that it was just that surrounded by a garter stitch border. Armed with that knowledge, I quickly developed my own version of the Haven scarf. 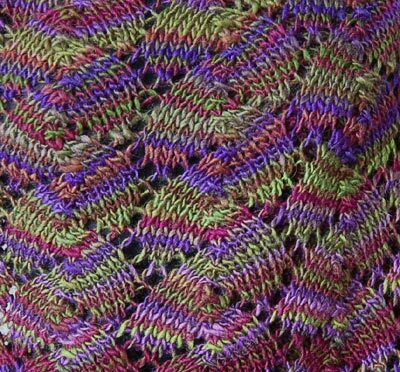 I first started with knittingonthenet's Shell Lace Pattern. I then modified the lace pattern so that the sl, K2tog, psso was just a K3tog. I didn't like the look of the slipped stitch and thought the k3tog looked more centered. I also cast on enough stitches to do a slipped 3st garter border on each side (slipped 1st stitch, purled last stitch) and two lace repeats. I also began and ended the scarf with 6 rows of garter stitch. After knitting a few swatches to make sure I was getting the look I wanted, I chose Loops & Threads Charisma.It is cheap and soft. It does tend to pill easily however and can split. I also apologize for this last photo. I had a hard time while wearing it to get the photo to accurately represent the color while showing the lace pattern. The orginal stitch is called the Horseshoe Print stitch pattern in the Leisure Arts LIttl book "Beginners Guide to Knit Stitches and Easy Projects." Hope this is helpful. The popular Kim H and Haven is located on Raverly. I would wish she would sell this singlepattern there since reviewers of her booksay the directions are confusing to Americans. That would help her make money for her lovely designs, sell her book to those of us who CAN interpret her directions, and get her name out there further. Hint.Kim.